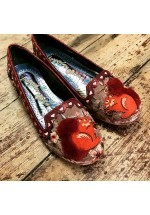 Beauitiful Binksey Bear Flats with polar bear and winter wonderland scene ..
Irregular Choice Carnival Circus (Black Multi) - Limited Edition !!! 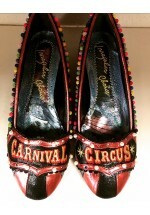 Step right up and embrace your inner ring master in these sensational circus themed flats. 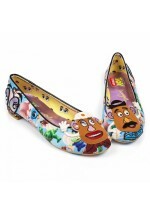 F..
"Oh my little sweet potato!" 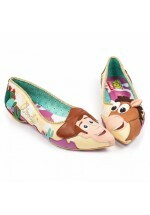 these super fun Mr & Mrs Potato Head flats are a marriage m..
Ride like the wind in these slip-on flats featuring the best of friends, Woody and his trusty horse .. 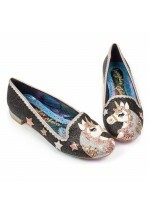 These comfortable slip-on showstoppers have it all; unicorns, rainbows, clouds, hearts, pearls and a..
Squirrel away your tootsies into these slipper style flats, comes with a fluffy squirrel character o..
Ruby Shoo's 'Lydia' shoe is set on a low-block heel and featuring a buckled ankle-strap and featurin..